“Suspect in anyone with a fever or a history of fever who previously visited a malaria endemic area” …regardless of prophylaxis or if they noticed any mosquito bites. Prophylaxis does not guarantee protection. One bite is all it takes! A careful travel history is essential: severe infection (e.g. P. Falciparum) often needs intensive care as sudden deterioration can occur initially. Non-specific symptoms: sudden chills, rigors, profuse sweating, fever (cyclical or continuous), cough, malaise, myalgia, anorexia, headache, nausea, vomiting and diarrhoea. Beware of mimics including chest infection, gastroenteritis and other travel related infections (e.g. hepatitis, dengue and viral haemorrhagic fever). 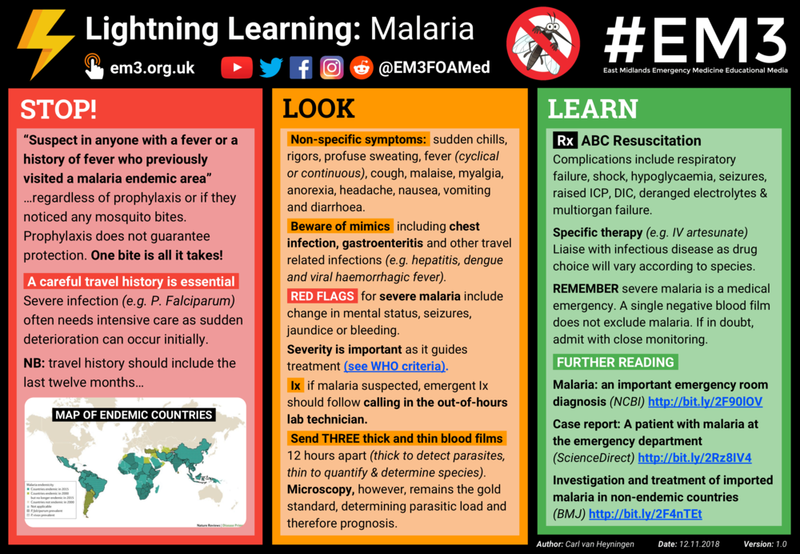 RED FLAGS for severe malaria include change in mental status, seizures, jaundice or bleeding. Severity is important as it guides treatment (see WHO criteria). Ix if malaria suspected, emergent Ix should follow calling in the out-of-hours lab technician. Send THREE thick and thin blood films 12 hours apart (thick to detect parasites, thin to quantify & determine species). Microscopy, however, remains the gold standard, determining parasitic load and therefore prognosis. Rx ABC Resuscitation: complications include respiratory failure, shock, hypoglycaemia, seizures, raised ICP, DIC, deranged electrolytes & multiorgan failure. Specific therapy (e.g. IV artesunate) Liaise with infectious disease as drug choice will vary according to species. REMEMBER severe malaria is a medical emergency. A single negative blood film does not exclude malaria. If in doubt, admit with close monitoring.